Pikmin 2, the sequel to Pikmin is a real-time strategy video game, and improves on it's predecessor with a 2-player mode, two new types of pikmin and a pikmin-esque creature "Bulbmin", and removal of the time limit. 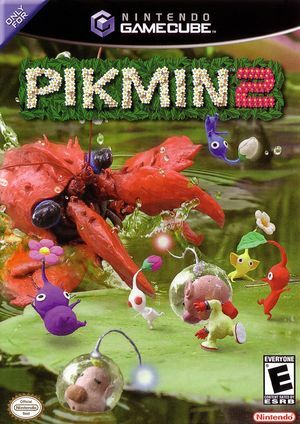 Pikmin 2 is widely considered an improvement over the previous title, receiving universal acclaim from reviewers. Pikmin 2 was re-released for the Wii as part of the New Play Control! series in Europe, Australia, and Japan in 2009, and North America in 2012. As of 5.0-845, Pikmin 2 suffers from intermittent crashing with default settings, either immediately at startup or delayed until the middle of gameplay. Checking "Enable MMU" in the game's properties solves this issue. See issue 9899. Fixed by 5.0-2079. The Widescreen hack has clipping and HUD alignment issues. Pikmin 2 normally runs at 30 FPS but can render at 60 with the following Action Replay code. 60 FPS rendering breaks cut-scenes, so the effect can be adjusted via the d-pad. The graph below charts the compatibility with Pikmin 2 since Dolphin's 2.0 release, listing revisions only where a compatibility change occurred. r7478 Windows 7 Intel Pentium E5800 @ 3.2GHz x ATI Radeon HD 5450 Game runs smoothly at 100%. problems are: longer loading times, all water is black, sounds are incorrect and off. Other than these You'll have to use OpenGL rather than directX9. other than these, this game runs great. r7714 Windows 7 Intel Core i3-370M @ 2.4GHz AMD Radeon HD 6370M Fully playable: No slowdowns, no known glitches during gameplay. During intro movie sequence after starting a new game, press the Start button ASAP to skip it, this will avoid a system crash that happens after your character has disembarked from the ship and is being spoken to by two other characters. 3.0-601 Windows 7 AMD Phenom x3 @ 2.1GHz AMD Radeon HD 6770 Fully playable using Direct3D9 at 1920x1080 internal resolution, runs at a consistent 30FPS speed, faster than any other game I have tested on this system in fact. Have experienced no crashes an hour into the game, watched the intro sequence with no crashes either. However, severe graphical glitches will be encountered unless EFB copies is enabled. 3.5 Windows 7 Intel Core i5-2500 AMD Radeon HD 6950 Played the entire game, getting the 201 treasures. It runs perfectly and really takes advantage of the high resolution the emulator can offer. You can play always zoomed out. 3.5-367 Windows 7 Intel Core i3-2100 @ 3.1GHz ATI Radeon HD 5450 Perfect, runs at full speed and there are no graphic errors. 4.0-926 Mac OS X 10.9 Intel Core i7-3520M @ 2.9GHz Intel HD Graphics 4000 Abysmal, freezes immediately or within 3 minutes of play, even with minimal settings. This needs further work. This page was last edited on 1 March 2018, at 07:50.